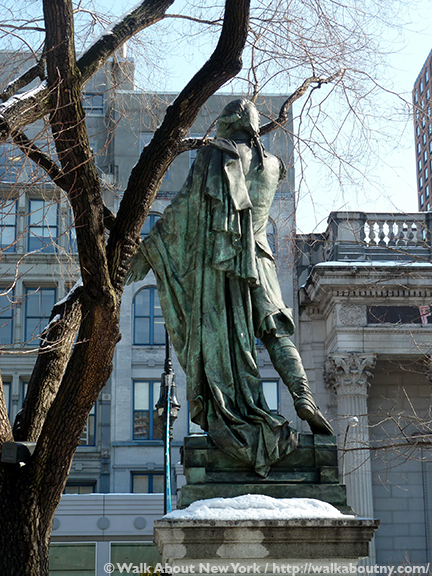 The bronze of the Marquis de Lafayette at the east side of Union Square. Today, July 4th, is celebrated as Independence Day in the United States, when the American British colonies declared their intent to separate from the United Kingdom. The Declaration of Independence stated the colonists’ reasons and ideals. This rebelliousness led to the American War for Independence, also known as the Revolutionary War in the United States, lasting seven years from 1776 to 1783. 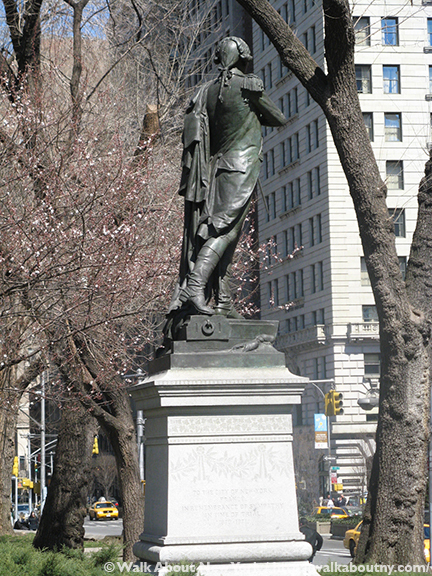 There are other New York sculptural tributes to Lafayette; watch for them in the future. With eyes cast heavenward the Marquis pledges his services to the American rebels. One of the outstanding military officers of that war was Marie Joseph Paul Yves Roche Gilbert du Motier, Marquis de Lafayette. 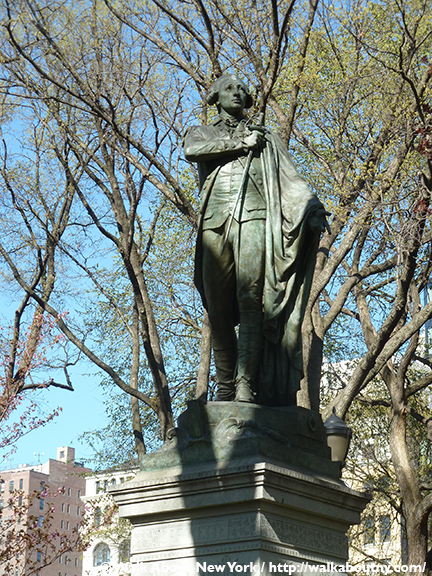 The French general is honored with a larger-than-life-sized sculpture in Union Square. Frédéric-Auguste Bartholdi (1834–1904) sculpted this likeness of the Marquis. It was a gift to New York City from the French government, as was another work designed by Monsieur Bartholdi, the Statue of Liberty. The bronze of the Marquis was the work of art that made the French sculptor’s reputation, earning him the honor of designing and fabricating Miss Liberty from copper. The Frenchman’s extended left hand offers his energy and efforts to the cause of liberty. The Lafayette Dollar, a silver coin, was in the U.S. exhibit at the Paris World’s Fair, 1900. 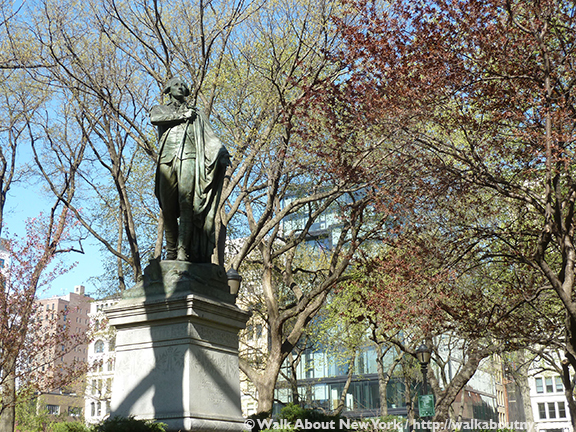 The figure of the Marquis stands eight feet tall upon a six-and-a-half foot high pedestal. 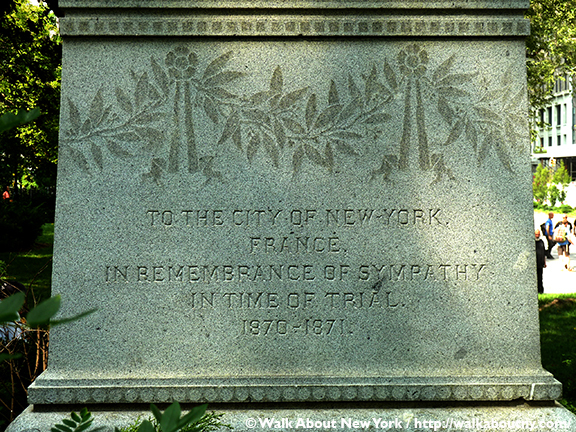 This support, made from pink Quincy granite, was a gift from the French citizens living in New York City. The understated but elegant pedestal is decorated with oak and laurel leaves, as well as ribbons, symbolizing courage and honor. The glossy patterns stand out against the matte surface of the granite. 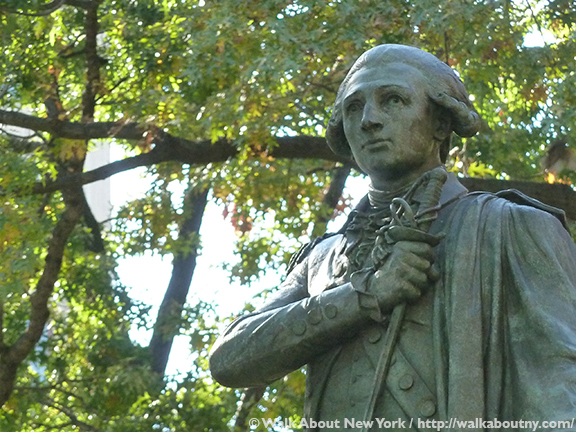 The Marquis de Lafayette served valorously in the Revolutionary War’s Virginia campaign. 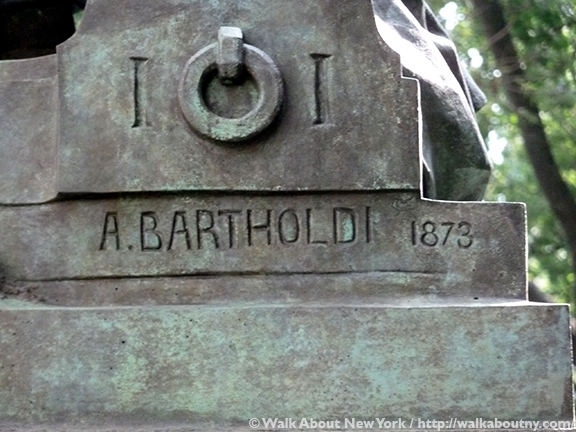 The sculptor’s name and date the bronze was cast. Dedicated on September 6th 1876, the 119th anniversary of the birth of the Marquis, Monsieur Bartholdi’s work was unveiled at Union Square. The bronze was gift from the French government to show its gratitude for aid given by New York City when Paris was under siege from the Germans during the 1870 Franco-Prussian War. It is for this reason that the left-hand side of the pedestal bears the inscription “in remembrance of sympathy in times of trial.” When the American forces arrived in Paris during the First World War, Lieutenant Colonel Charles Stanton declared, “Lafayette, we are here” as he stood at the grave of the French nobleman. Counties and towns across the U.S. are named to honor the French aristocrat. 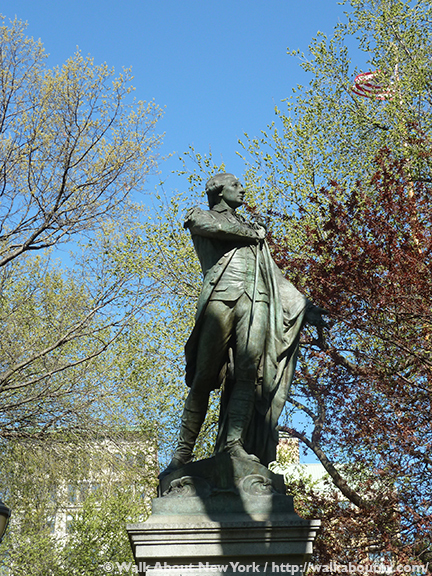 The left-hand side of the pedestal for the bronze of the Marquis de Lafayette. This bronze sculpture, cast in 1873, depicts the Frenchman, who was raised to the rank of general by George Washington, as a young man. He is shown on the prow of a boat, sailing to the aid of the colonists. He holds his sword in his right hand with it placed over his heart, pledging himself to fight for the ideals of liberty, and offering his efforts for cause of the American colonies. 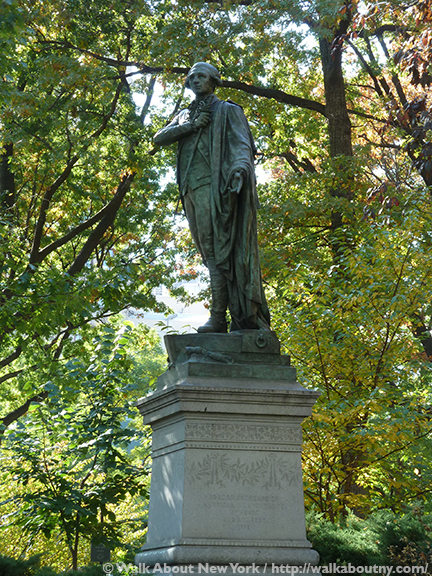 The right-hand side of the pedestal for the bronze of the Marquis de Lafayette. 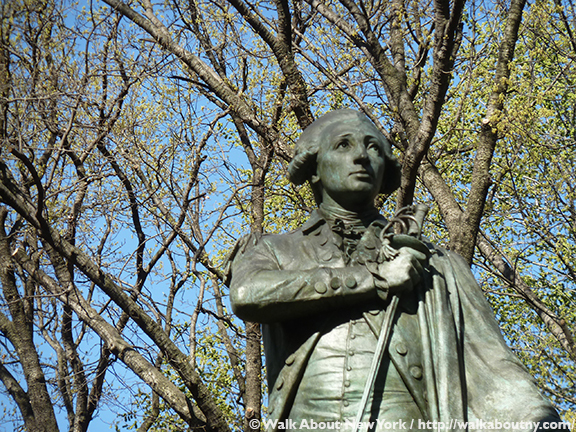 The Marquis was a favorite of General Washington, appointing him Major General in 1777. The Marquis demonstrated courage under fire, becoming a favorite of George Washington; they became fast friends. So much so, that the Marquis named his son and heir, Georges Washington Louis Gilbert de Lafayette. The senior Lafayette contributed diplomatic aide too, helping secure French naval support for the American cause. As a proponent of democracy, Lafayette was a leader of the French Revolution of 1789. Lafayette helped write France’s 1789 Declaration of the Rights of Man. When the Marquis died on May 20th 1834, aged 77, Louis-Philippe, King of the French, did not officially acknowledge his death. He allowed only a minor military funeral, and the crowds were held back by bayonet point. By contrast, the expressions of grief by Americans was even greater than when George Washington died in 1799. Flags flew at half-mast for thirty-five days. John Quincy Adams, the former president, read a eulogy at a joint session of Congress, with President Andrew Jackson and his cabinet, the Supreme Court justices and members of the diplomatic corps attending. A 24-gun salute was fired at daybreak by every navy ship and at every military post, and a single cannon was shot every half-hour afterwards until sunset. Officers of the army and navy wore black armbands for six months, and average American citizens were encouraged, by the president, to dress in mourning for thirty days. Wandering about the Big Apple we see statues placed within the cityscape; it is good to remember whom the people were; what they did to deserve the honor; and why they remain in our memories. 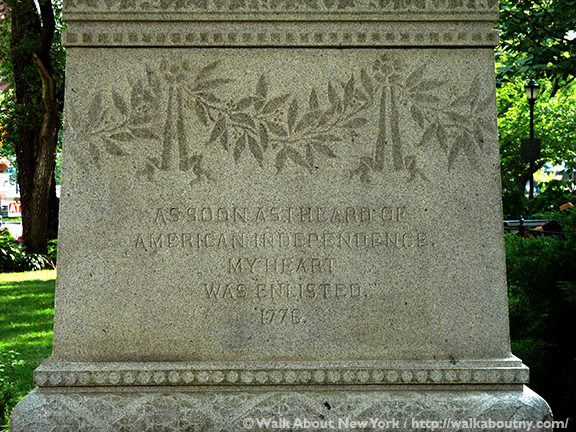 Read another Independence Day-related article we published. 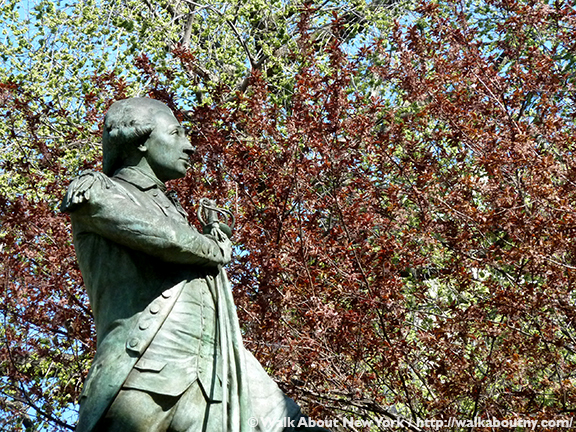 Discover the bronze sculpture of the Marquis de Lafayette when you part of our Five Squares and a Circle Tour. It is in Union Square, the second of the five squares. Take the Tour; Know More!